RENO, Nevada -- A gunman with a hostage opened fire from the eighth floor of a luxury high-rise condominium in Nevada onto the streets below, authorities said. No injuries were reported. The man died Tuesday after a SWAT team descended on him while he was barricaded at the Montage, Reno police Deputy Chief Tom Robinson told reporters. It wasn't immediately clear whether he was killed by police gunfire or his own. No one else, including the hostage, was hurt. The gunman's name has not been released. Robinson described him only as a young adult. The luxury high-rise is surrounded by some of downtown Reno's most popular casinos, and the gunfire brought eerie echoes of the Las Vegas shooting two months earlier that killed dozens. But there were no reported injuries in Tuesday's attack as the streets were mostly empty on a cold weeknight. "When you heard it's coming from above it reminds you of the guy shooting from Mandalay Bay," said Mike Pavicich, who was in town on business from Las Vegas and was standing atop a parking garage at the neighboring Eldorado Resort Casino when the shots rang out. "It's scary, you know?" Pavicich told the Review-Journal. "This is the same kind of town." 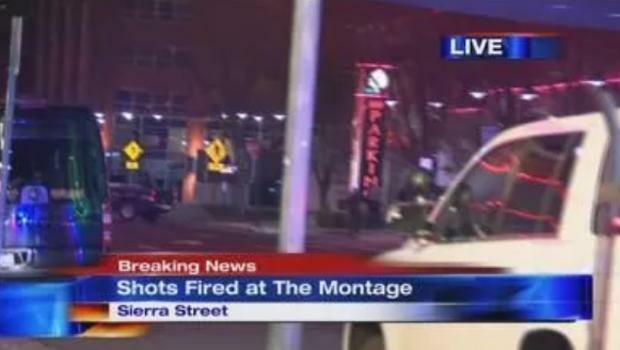 Residents at the Montage said they had been told to lock their doors and stay inside during the incident, CBS affiliate KTVN reports. Sixty-four-year-old Paddock modified an AR-15 to loose a stream of constant bullets like an automatic weapon in the attack at Las Vegas, which is 450 miles south.